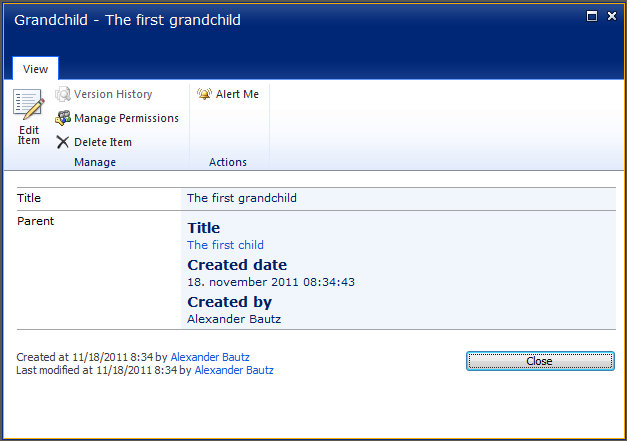 09.12.2011 I have updated the solution to v1.1 to let the user chose the icon (or no icon) before the “child” title. The code for the file “ParentChildResources.js”, and the CEWP code for “Parent DispForm” and Child DispForm” has changed. The new “argObj-property” “iconBefore” should be the path to the image to prepend to the “child title”. This involves putting scripts in NewForm and/or DispForm in three lists. Please follow the steps carefully. Please note that this code is for SharePoint 2010 only. This list has the Title field only. Add one field of type Lookup (single choice) with the name “Parent”. This lookup should target the title field of the "Parent" list. Add one field of type Lookup (single choice) with the name “Parent”. This lookup should target the title field of the "Child" list. The code is presented in individual folders so it’s easy to get the right code in the right form. Edit the code that goes in the CEWPs to fix the script src attributes in all files, the “childListUrl” in the DispForm code and the various “argObj” variables if your lists or fields has different names. You will have to read trough the code for the CEWPs to find the bits to change. The file “ParentChildResources.js” does not need any modification. Upload the code to a shared document library and maintain the folder structure (or rename the files so that you know which file goes where). Add CEWPs to the list forms and insert the code corresponding with the folder and file name. It is important that you use the content link option to link to the code. To add a CEWP, go to the list, activate it by clicking in the “list area” to bring up the list tools ribbon. Select the tab “List” and “Form Web Parts”. Edit the page and activate the CEWP. In the ribbon toolbar, select “Web Part Tools” and then “Web Part Properties”. To ensure you get the correct file path, go to the document library, right click the file and select “Copy shortcut”. Paste this URL in the content link field. You might want to edit the URL to make it relative. Note Add the CEWP below the list form. This solution uses the Client Object Model introduced in SharePoint 2010 and therefore it will not work on previous SharePoint versions. To keep this solution clean and simple, the last bits from the request regarding the lookup column, is kept out of this post – it will be emailed to the person requesting this article. If there is demand for it, i will post it as an appendix to this post later on. Hope someone can make use of this code. the “customOpenInDialog” function doesn’t seem to want to work for me. I replaced it with the “OpenPopUpPage” function found out of the box in SharePoint 2010 and it works like a charm. I actually did not know of the function “OpenPopUpPage”. Did you get any errors on the page? – any other indications of what went wrong? No indications. The new version seems to be working perfectly. I use OpenPopUpPage a lot just cause its quick and easy! Whats the reason for the green status indicator? Updated to v1.2 and changed the function that opens the “child newform” as some users reported errors when using the existing function. Just a little bug: When the ViewField value (Parent DispForm) is a lookup field, [Object Object] is displayed. Thank you for the feedback. This will be true for PeoplePickers and DataTime field as well. Let me know if it’s a problem, and I’ll see if i get the time to update the solution. For some reason after I add the CEWP the scroll bars on my modal dialog disappear (but show back up if I maximize the modal dialog), Any ideas? from ParentChildResources.js seems to do the trick! Download the code from here – this link does not work. The redirect from my old server has failed. The link is updated. Wow that was fast! Thanks for the quick update. I noticted it yesterday evening but I thought I was having a connection issue. Also, thanks for all your work here. It’s people like you that enables power users (i.e., none coders) like me with the tools to do some cool stuff!! Hello Alexander, thank you for the article, its a very nice solution, i need to do the same thing but with document libraries instead of lists, we dont have the newform.aspx in that case and also an upload popup window shows before you can save the data in the library, how can i use your technique in a similar case but using document libraries instead of lists? I do not think you can have this solution in a document library. settings paage to delete these fields.”. Would someone please help me? First of all thx a lot for sharing, it has been a great help. I have a question: Is it possible to place the “Children”-field in between two fields? E.g. I have been trying, but I cannot figure out how to place it other then at the end of the last field in my list. 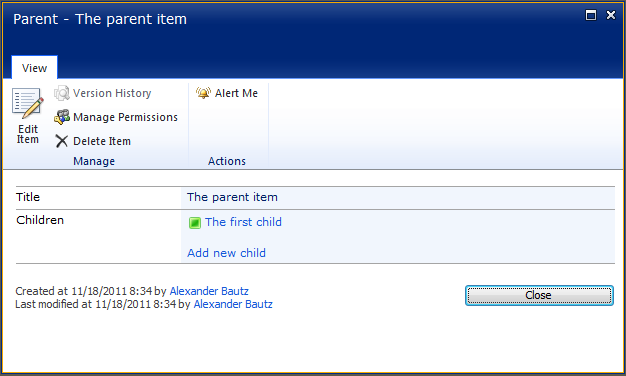 This will insert the “Children” field after the “Title” field. Managed to get this all working, question. Instead of having the drop-down select box. 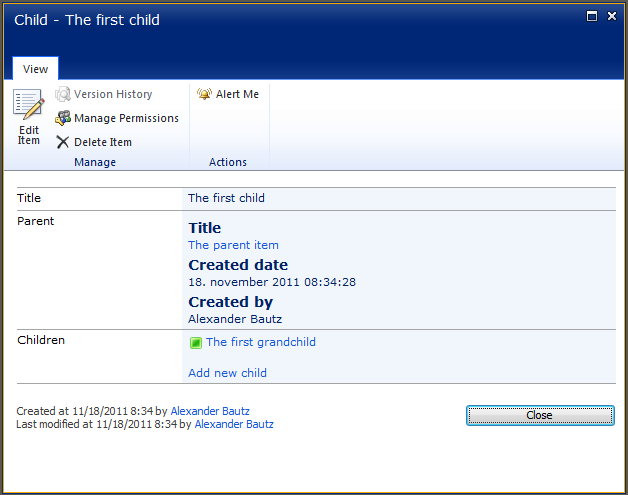 Do you have a way to id the lookup so that the user just has to add new records to Child and Granchild forms? I do not have a solution to this on the top of my head, but have you looked at the vLookup solution? this might be useful. Each Employee would have their own tasks and each task could have many Task Approvals. Basically a 1 to many to many. So if you open an employee record you could add a task, then view the task and add an approval for that task. Sorry for the delay. I think you could use the vLookup solution as this has what you are asking for. Set ut the solution as specified in this article: https://spjsblog.com/2012/07/21/vlookup-for-sharepoint-2010-2/ and refer this article https://spjsblog.com/2013/08/20/vlookup-for-sharepoint-2013-v1-5/ for details on the latest version. The vLookup solution must be added to the DispForm of this list. Configure it to look in the Tasks list in the field “Employee” using “[currentItem:ID]”. Set it up with “InURL” from field “ID” to field “Employee”. Add one column of type lookup – single choice – name it for example “Employee”. This columns targets the “Employee” list in a field of your choice. The vLookup solution must be added to NewForm and DispForm of this list. Configure it to look in the TaskApproval list in the field “Task” using “[currentItem:ID]”. Set it up with “InURL” from field “ID” to field “Task”. Add one column of type lookup – single choice – name it for example “Task”. This columns targets the Tasks list in a field of your choice. The vLookup solution must be added to NewForm in this list. Hope this helps you on the way. Will this work with SP foundation? Yes, it will work with SP Foundation. If this is vLookup you must trigger the setup “manually” the first time (as described in the article under “First setup”). Link exchange is nothing else but it is only placing the other person’s web site link on your page at proper place and other person will also do similar for you.